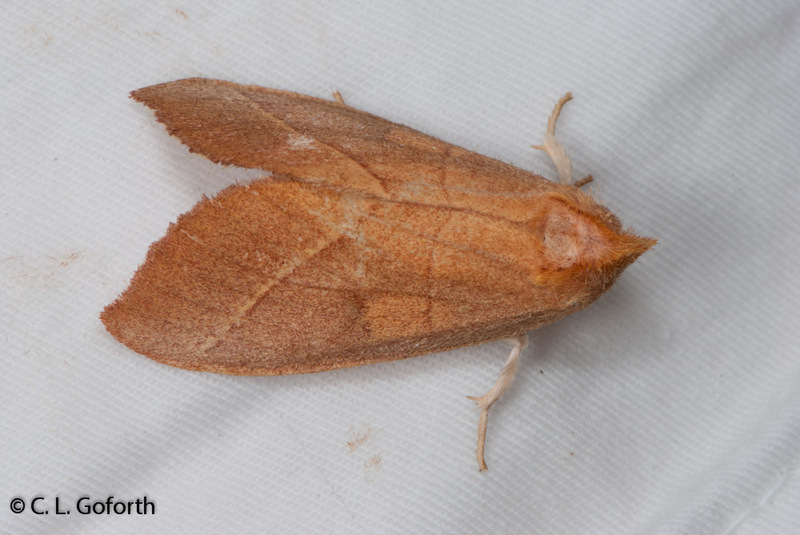 I hosted a public moth night for National Moth Week over the weekend. I was really ready. 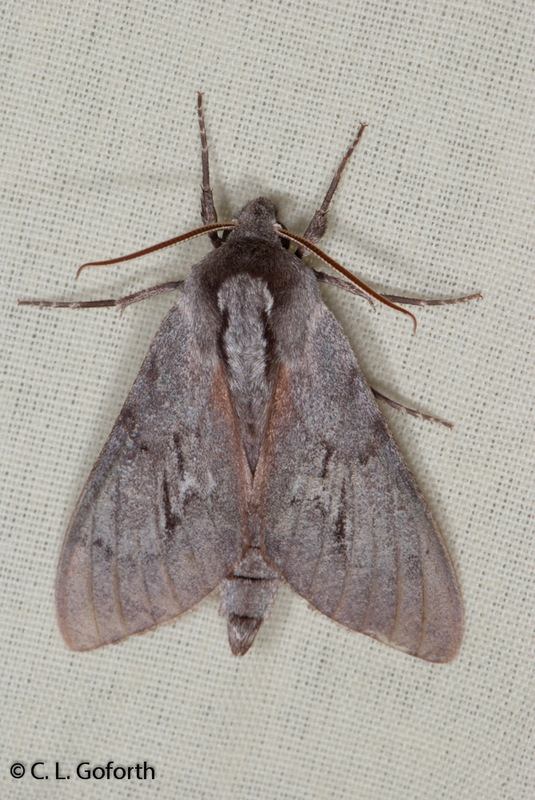 I had enough lights, traps, and baits to have about 8 moth viewing stations spread across the grounds. I had a good 50 people signed up to come, several of whom were planning to stay the full 8 hours, and four entomologists ready to teach people about moths and help with identifications. I had a computer ready to go so we could start uploading photos to a citizen science website and even had coloring sheets for the kids in case they got bored. I was so excited! I met the visitors out by the entrance gate and looked off into the distance. There were some really dark clouds out there, but they looked like they were headed a different direction and wouldn’t cause us problems. I decided to press on with the event, hoping that we could sit out any rain in the outdoor classroom and then carry on as planned. I took everyone down to our outdoor classroom and did my little introduction to the moths. Then we wandered out to some of the lights. A few people disappeared down the path to see the trap and baits that one of the entomologists had set up and I took people over to my blacklight. But the clouds kept coming. It was soon clear that it was going to rain, so about half the people left. The other half headed inside the classroom and watched as a wall of black clouds engulfed us. Then it rained. Oh boy did it rain! It was what I imagine sitting through a hurricane would feel like! I am never one to shy away from watching a storm, but it’s one thing to watch a heavy storm from the safety of the indoors and quite another to watch from a glorified screened porch. It was unbelievably noisy. Rain slammed down onto the roof. There was lightning crashing all around. Thunder boomed as wind blasted through the room. Rain started blowing over everyone taking shelter in the classroom and everything got wet. I’ll admit: it was a little scary. But, oh! It was so beautiful! Sadly, most of the remaining people bailed as soon as the rain let up well over an hour later, but some hearty souls stuck it out. A couple of people stayed after midnight and one person stayed until close to 1 am. In the end it was just me and one other bug person from the Museum sitting on the porch of the classroom watching the moths that came to the mercury vapor lights. We were out there until 3:30 am, watching moths and talking about bugs. I even saw my very first flying squirrel and that alone would have made the whole night worth it. But we saw a lot of moths too! 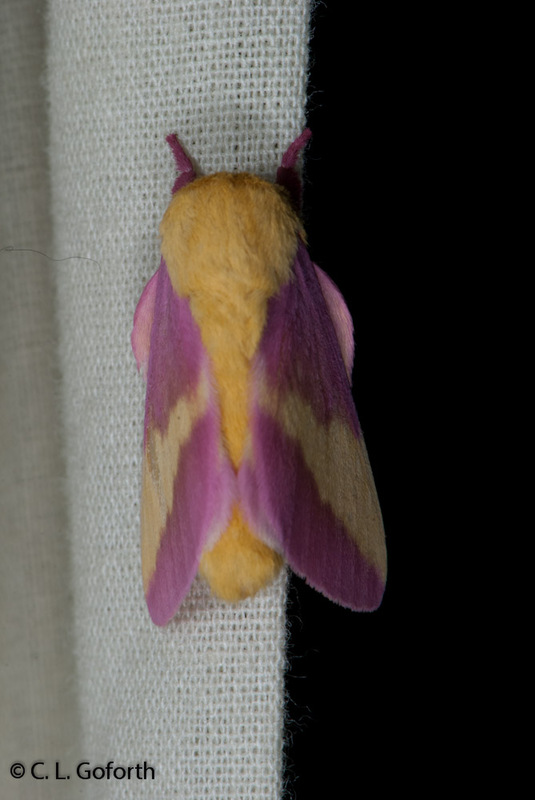 It certainly wasn’t the explosion of thousands of huge moths that I’m used to from the Arizona monsoon season and we never did get any of the big silkworm moths or hawk moths, but we still saw several gorgeous species. Nearly all of them were new to me and therefore exciting. I didn’t start photographing the moths until late in the evening and I missed documenting several of the early evening species, but I still walked away with photos of thirty species. (You’ll notice I don’t have the species names on two of the photos here – I’m waiting for confirmation so I don’t reveal my abysmal moth identification skills!) The moth expert with the trap sent me a list of the things he caught and brought my total up to 40 species. A very few participants also left photos with me before they left and added another five. 45 species ain’t half bad, especially considering the circumstances. And now I have a moth evening program planned too! I can easily do another one of these moth nights as I have all the equipment, books, and handouts I need ready to go. I’m thinking of trying again in a month or so. It won’t be National Moth Week anymore, but I love spending nights by blacklights and sharing that with the public is so much fun. It will be good to get back out there and work on my moth identification skills too. I really need some more practice with that. 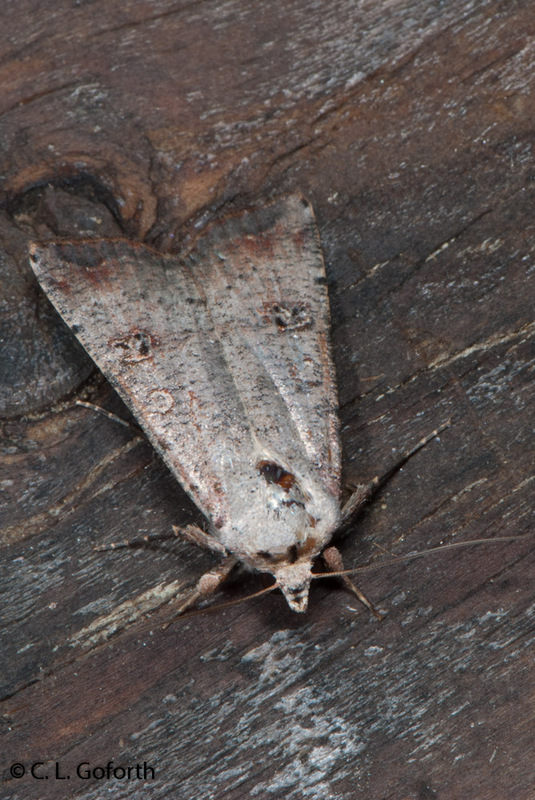 So, my National Moth Week event wasn’t the huge success I hoped for, but I still walked away happy. I can think of worse ways to spend an evening than sitting through a gorgeous storm, talking to people about bugs, photographing insects, and seeing a flying squirrel. Not a bad night. Not bad at all. Great story. I can understand your excitement about moths – I saw my first Polyphemus moth a couple of weeks ago! Ooh, nice! Those things are BEAUTIFUL! I think the big silkmoths like that are what draw a lot of people into mothing. They’re just so amazing. I’d offer congratulations on your dry run, except that it sounds like more of a wet run. Regardless – nice pics you got! Thank you! It ended up being pretty fun, in spite of the rain. Lovely photos! The Ailanthus is very interesting. Isn’t it a pretty moth? I really love that one. It’s super common here, but so beautiful! The flying squirrel would have made up for everything for me, too! Oh, it was awesome! The highlight of the night for me in fact. They’re one of many species I thought were exotic, maybe from Africa or somewhere tropical, that are actually found in North Carolina. Now I’ve seen venus flytraps and flying squirrels in the wild! I love NC! Ooh, you’re right! Thanks! And I don’t think improvements to a post are ever out of date, so please feel free to comment any time you have something you can add, or even if you just want to say something. I welcome comments on older posts! 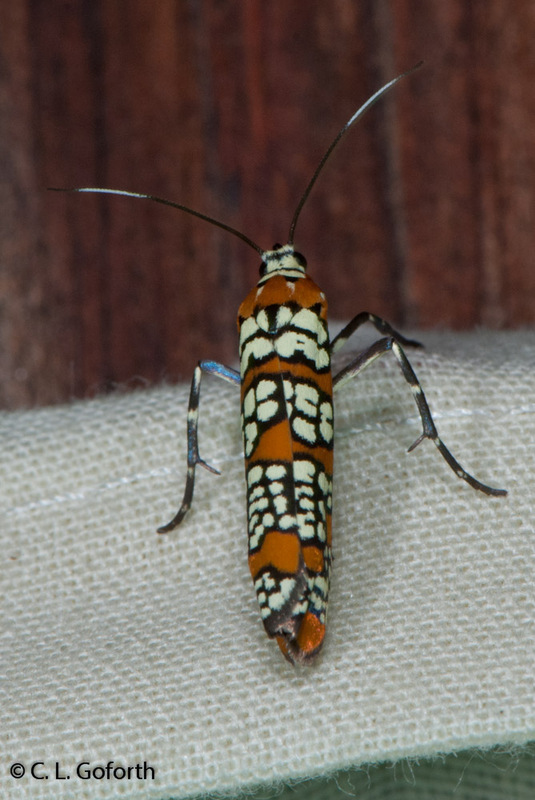 The other unidentified moth looks like a white- dotted prominent, Nadata Gibbosa. Its one of my personal favorites! Yes! That looks quite right, though I did have to peer through some moth sites to make sure the lack of white spots wasn’t a problem. Thanks for the ID! I meant to come back and try to ID the unidentified ones at some point and then never did. Appreciate the assist!